Accepted in the Journal of Physical Chemistry A, with my fingers crossed for pulling off the rare double-header in an upcoming print edition of the journal (having missed it by three intermediate articles with the Cs2B12H12 and HMX papers back in 2006 (you’d keep track, too). A fortuitous overlap of scheduled defense dates between P. Hakey, Ph.D. and M. Hudson, A.B.D.). A brief summary of interesting points from this study is provided below, including what I think is a useful point about how to most easily interpret AND represent solid-state vibrational spectra for publications. 1. AS USUAL, YOU CANNOT USE GAS-PHASE CALCULATIONS TO ASSIGN SOLID-STATE TERAHERTZ SPECTRA. It will take a phenomenal piece of data and one helluvan interpretation to convince me otherwise. As a more subtle point (for those attempting an even worse job of vibrational mode assignment), if the molecule exists in its protonated form in the solid-state, do not use the neutral form for your gas-phase calculation (this is a point that came up as part of an MDMA re-assignment published (and posted here) previously). 2. It is very difficult to find what I would consider to be “complete data sets” for molecules and solids being studied by spectroscopic and computational methods. For many molecular solids, the influences of thermal motion are not important to providing a proper vibrational analysis by solid-state density functional theory methods. Heating a crystal may make spectral lines broader, but phase changes and unusual spectral features do not often result when heating a sample from cryogenic (say, liquid nitrogen) to room temperature. Yes, there are thousands of cases where this is not true, but several fold more cases where it is. We are fortunate to live in a temperature regime where characterization is reasonably straightforward and yet we can modify a system to observe its subtle changes under standard laboratory conditions. The THz spectrum of S-(+)-Ketamine Hydrochloride gets a bit cleaner upon cooling, which makes the assignment easier. As the ultimate goal is to be able to characterize these systems in a person’s pocket instead of their liquid nitrogen thermos, the limited observed change to the spectrum upon cooling is important to note. 3. Crystal06 vs. DMol3 – This paper contains what is hoped to be a level, pragmatic discussion about the strengths and weaknesses of computational tools available to terahertz spectroscopists for use in their efforts to assign spectra. This type of discussion is, as a computational chemist using tools and not developing tools, a touchy subject to present on not because of the finger-pointing of limitations with software, but because the Crystal06 team and Accelrys (through Delley’s initial DMol3 code) clearly are doing things that the vast majority of their users (myself included) could in no way do by themselves. The analysis for the theory-minded terahertz spectroscopist is presented comparing two metrics – speed and functionality (specifically, infra-red intensity prediction). What is observed as the baseline is that both DMol3 and Crystal06 make available density functionals and basis sets that, when used at high levels of theory and rigorous convergence criteria, produce simulated terahertz spectra with vibrational mode energies that are in good (if not very good) agreement with each other. For the terahertz spectroscopist, Crystal06 provides as output (although this is system size- and basis set size-dependent) rigorous infrared intensity predictions for vibrational modes, inseparable from mode energy as “the most important” pieces of information for mode assignments. While DMol3 does not produce infrared intensities (the many previous terahertz papers I’ve worked on employed difference-dipole calculations that are, at best, a guesstimate), DMol3 produces very good mode energy predictions in 1/6th to (I’ve seen it happen) 1/10th the time of a comparable Crystal06 calculation. This is the reason DMol3 has been the go-to program for all of the neutron scattering spectroscopy papers cited on this blog (where intensity is determined by normal mode eigenvectors, which are provided by both (and any self-respecting quantum chemical code) programs). Now, it should be noted that this difference in functionality has NOTHING to do with formalism. Both codes are excellent for what they are intended to do. To the general assignment-minded spectroscopist (the target audience of the Discussion in the paper), any major problem with Crystal06 likely originates with the time to run calculations (and, quite frankly, the time it takes to run a calculation is the worst possible reason for not running a calculation if you need that data. Don’t blame the theory, blame the deadline). In my past exchanges with George Fitzgerald of Accelrys, the issue of DMol3 infrared intensities came up as a feature request that would greatly improve the (this) user experience and Dr. Fitzgerald is very interested (of course) in making a great code that much better. Neither code will be disappearing from my toolbox anytime soon. 4. The Periodicity Of The Molecular Solid Doesn’t Care What The Space Group Is – One of the more significant problems facing the assignment-minded spectroscopist is the physical description of molecular motion in a vibrational mode. In the simplest motions involving the most weakly interacting molecules, translational and rotational motions are often quite easy to pick out and state as such. When the molecules are very weakly interacting, often the intramolecular vibrational modes are easy to identify as well, as they are largely unchanged from their gas-phase descriptions. In ionic solids or strongly hydrogen-bonded systems, it is often much harder to separate out individual molecular motions from “group modes” involving the in- and out-of-phase motions of multiple molecules. In the unit cells of molecular solids, it can be the case that these group modes appear, by inspection, to be extremely complicated, sometimes too involved to easily describe in the confines of a table in a journal article. S-(+)-Ketamine Hydrochloride is one such example where a great simplification in vibrational mode description comes from thinking, well, “outside the box.” The image below shows two cells and the surrounding molecules of S-(+)-Ketamine Hydrochloride. As it is difficult to see why the mode descriptions are complex from just an image, assume that I am right in this statement of complexity. Part of this complexity comes from the fact that the two molecules in the unit cell are not strongly interacting, instead packed together by van der Waals and dispersion forces more than anything else. 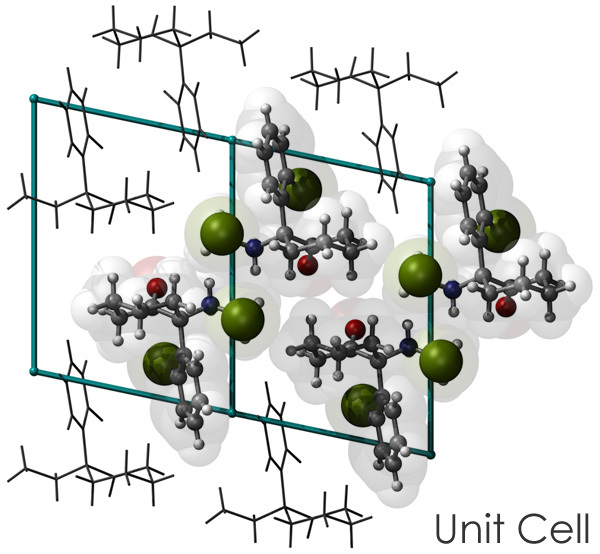 The key to a greatly simplified assignment comes from the realization that the most polar fragments of these molecules are aligned on the edges of the unit cell. An alternate view of molecular vibrational motion comes from considering not the contents of the defined unit cell but the hydrogen-bonding and ionic bonding arrangement that exists between pairs of molecules between unit cells. The colorized image below shows two distinct chains (red and blue) that, when the predicted vibrational modes are animated, become trivial to characterize as the relative motions of a hydrogen/ionic-bonded chain. Rotational motions appear as spinning motions of the chains, translational motions as either chain sliding motions or chain breathing modes. It appears as a larger macromolecule undergoing very “molecular” vibrations. In optical vibrational spectroscopy, selection rules and the unit cell arrangement do not produce in- and out-of-phase motions of the red and blue chains, as only one “chain” exists in the periodicity of the unit cell. In neutron scattering spectroscopy, these relative motions between red and blue would appear in the phonon region. This same discussion was had, in part, in a previous post on the solid-state terahertz assignment of ephedrine (with a nicer picture). So, look at the cell contents, then see if there’s more structure than crystal packing would indicate. It greatly simplifies the assignment (which, in turn. greatly simplifies the reader’s digestion of the vibrational motions). Abstract: The terahertz (THz) spectrum of (S)-(+)-ketamine hydrochloride has been investigated from 10 to 100 cm-1 (0.3-3.0 THz) at both liquid-nitrogen (78 K) and room (294 K) temperatures. 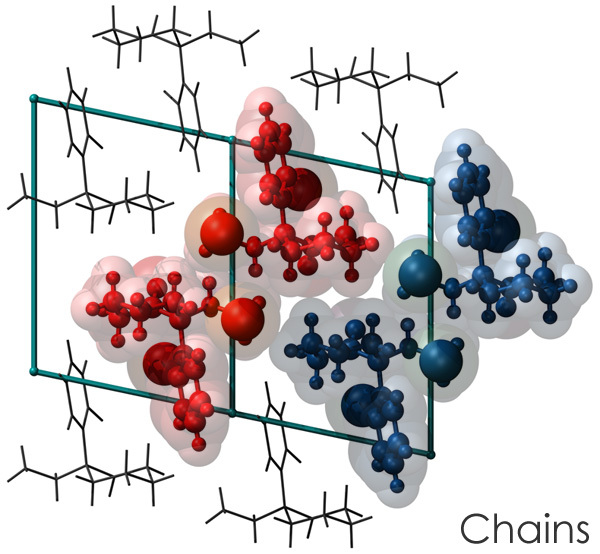 Complete solid-state density functional theory structural analyses and normal-mode analyses are performed using a single hybrid density functional (B3LYP) and three generalized gradient approximation density functionals (BLYP, PBE, PW91). An assignment of the eight features present in the well-resolved cryogenic spectrum is provided based upon solid-state predictions at a PW91/6-31G(d,p) level of theory. The simulations predict that a total of 13 infrared- active vibrational modes contribute to the THz spectrum with 26.4% of the spectral intensity originating from external lattice vibrations.